Jane Jacobs, one of the greatest theorists on cities of the 20th century, never visited Seoul, but the city’s energy and intensity would no doubt have impressed her. She likely would have written about the narrow streets and alleys full of pedestrians in the historic center of the city, the sound of children playing coming from playgrounds in vast apartment complexes and the laughter coming from groups of friends and co-workers on a busy Friday night. She would also have noted the many examples of the creative regeneration of old things that gives Seoul its unique vibe. Regeneration is a dynamic concept that allows for the creative updating of old things to new uses and sensibilities. Preservation is more static because it focuses on preserving old things authentically as a window on the past. Museums and famous buildings are the best example of the emphasis on authenticity in preserving historical treasures. Regeneration, by contrast, focuses on how old, new and in-between work together to create something new and unique. Jane Jacobs preferred regeneration because it implies people taking control of the city to define it on their terms. For Jacobs, people were central to the life of a city. Café Yeon reminds visitors of what Samcheong-dong used to be like. To understand regeneration in Seoul, we need to look at the recent history of old things in South Korea. Japanese colonial rule (1910–45) and the Korean War (1950–53) left South Korea impoverished and the future looked bleak. To overcome the situation, Korea adopted economic reforms in the 1960s that put it on the path of industrialization and export-led growth. The economy boomed, and Korea transformed itself into an urbanized industrial power in a generation. Democratization in 1987 and continued economic growth propelled it into the select group of advanced democracies by the 2000s. The upheavals of the 20th century, however, were not kind to old things. During the dark years of colonial rule and war, people focused on survival. As the economy boomed, they focused on keeping up with the unrelenting pace of change. In the rush to build a better life, people looked forward and, except for a few famous cultural relics, they did not value old things. To some, old things were a reminder of a past from which they wanted to escape; to others, they were obstacles that got in the way of progress. Things began to change in the 2000s as Korea became a wealthy democracy. In the 1990s, Koreans began traveling overseas in large numbers and many were impressed by the wealth of historic sites and streetscapes in places like Paris and London. In the 2000s, the first generation to grow up in a democratic and increasingly wealthy country came of age. This generation, now moving into their mid-30s, combines an outward looking confidence with a desire for a higher quality of life. It is also the first generation to grow up in the generic built environments devoid of old things. To this generation, old things are curious and exotic, and appreciating them is part of the search for a higher quality of life. The founders of Anarchy Bros in Huam-dong have converted an old Japanese colonial house into a café and pub. The first stirrings of interest in old things was the Samcheong-dong boom in the early 2000s. For years, the area lived under the shadow of the Blue House, but a loosening of restrictions under President Roh Moo-hyun made it easier for people to visit the area. Rents were cheap and young entrepreneurs began turning old houses, including many Hanok, into cafés and restaurants in creative ways. Many young people flocked to Samcheong-dong to enjoy the juxtaposition of old and new in the area. The popularity of Samcheong-dong caused rents to rise, forcing young entrepreneurs to move to other neighborhoods. Most of the remodeled houses have been replaced by newer buildings, but Café Yeon, one of the first Hanok café renovations, remains as an example of what things were like in the early 2000s. In the 2010s, the paradigm of young entrepreneurs renovating old building and houses in creative ways to give them a new life spread rapidly to other areas. Seochon, the neighborhood on the opposite side of Gyeongbokgung Palace from Samcheong-dong, became popular for its winding alleys and retro atmosphere. The area is a mixture of Hanok, low-rise multifamily units and commercial buildings of various ages and sizes. Song’s Kitchen, a small gourmet pizza restaurant, turned several walls of a Hanok into picture windows to open the house up to the surrounding area, which gives it a welcoming feeling. From Seochon, renovation of old buildings spread to areas further from the historic center of the city to areas such as Yeonnam-dong near Hongdae and Seongsu-dong southeast of the center. These areas developed in the 1960s and 1970s and have a retro atmosphere that evokes images of Seoul during the early years of the economic boom. As Seochon and other areas were attracting attention, a boom in guesthouses created new opportunities for young entrepreneurs. In the late 2000s, the city of Seoul began to promote guesthouses to accommodate an ever-rising number of tourists. A few years later, home sharing services like Airbnb made it easier for people to start guesthouses. Many houses built in the 1970s were large so that owners could rent out part of the house for extra income. As apartments became the norm in the late 1980s, these large houses were no longer popular, and many were demolished. Because of their size, many of these houses have been renovated into guesthouses. To attract customers, guesthouses began to pay more attention to design, which created a niche market for architects and designers. 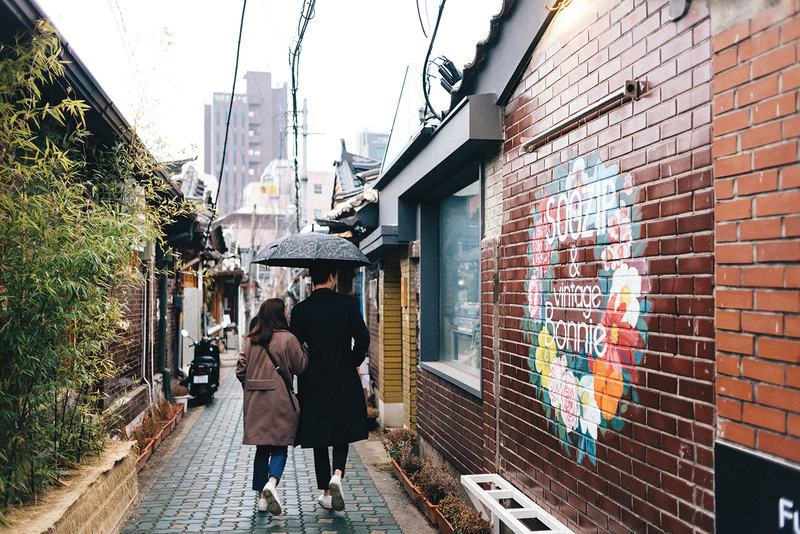 By the middle of the 2010s, cafés, bars, restaurants, shops, and guesthouses were popping up in neighborhoods in Seoul and around the country with a supply of old buildings and convenient transportation. Renovations ranged from minimal changes to complete overhauls, but most renovations highlight old elements, either from the existing building or added ones from other times and places. As elsewhere, most business owners rent the space they use and thus try to limit renovation costs. Using the existing structure effectively helps reduce costs and gives the renovation a sense of authenticity that a complete overhaul often lacks. 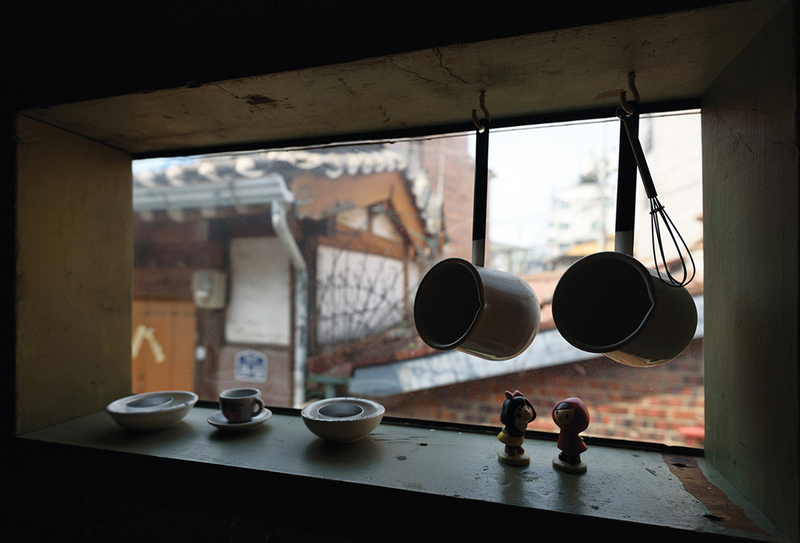 Song’s Kitchen in Seochon uses picture windows to open an old Hanok to the surroundings. 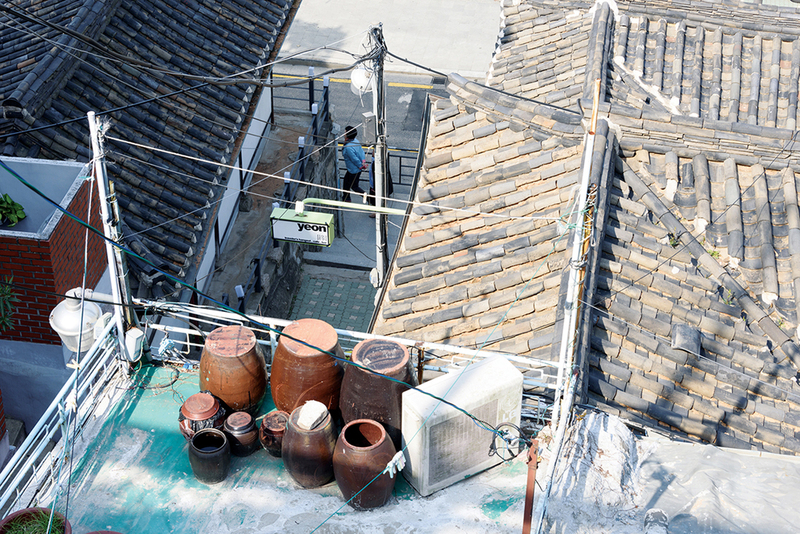 An old neighborhood of Hanok houses in central Seoul, the Ikseon-dong district is home to many repurposed Hanok homes. One of the most recent areas to see a wave of renovations is Huam-dong on the hill heading east from Seoul Station. Unlike other popular areas that have experienced regeneration, Huam-dong has the largest concentration of houses built by the Japanese during the colonial period. At that time, most Koreans lived north of the Cheonggyecheon Stream, and most Japanese south of it. Huam-dong was a popular place for Japanese to live because it was easy to get to the Japanese commercial center in Myeong-dong and military facilities in Yongsan. After liberation, Koreans lived in these houses, but they began to disappear rapidly in the late 1980s as owners tore them down to build more profitable multifamily units. Unlike Hanok, colonial-era houses are not considered historically valuable and receive no protection or support from the government. Nookseoul in Huam-dong is a stunning example of an 80-year old colonial-era house renovated as an upscale guesthouse. The architect, Kim Seunghoy left as much of the original structure intact as possible but updated the kitchen and the bathrooms in contrasting contemporary style. In 2016, the project received an award for innovative architecture from the city of Seoul. Nearby, the JiWol Jang Guest House turned a house built on a large lot where a luxurious colonial-era house used to sit into a relaxing guesthouse amid trees and a larger garden. One of the most interesting renovations is Huam Jubang, a fully equipped kitchen with a dining table that people can rent by the hour. The “shared kitchen” sits in the front of small 1960s-style house on a narrow side street. Several young architects started Huam Jubang to create a place for people to cook together and socialize in an attractive setting. In nearby Haebangchon, young entrepreneurs turned a downscale 1970s commercial space into the Laundry Project, a “social laundromat” with a café and workspace in bright, contemporary interior. Expensive housing in Seoul has forced many young people to find creative solutions to a problem that affects many big cities around the world. In recent years, young people have started to renovate apartments in less-desirable older buildings. 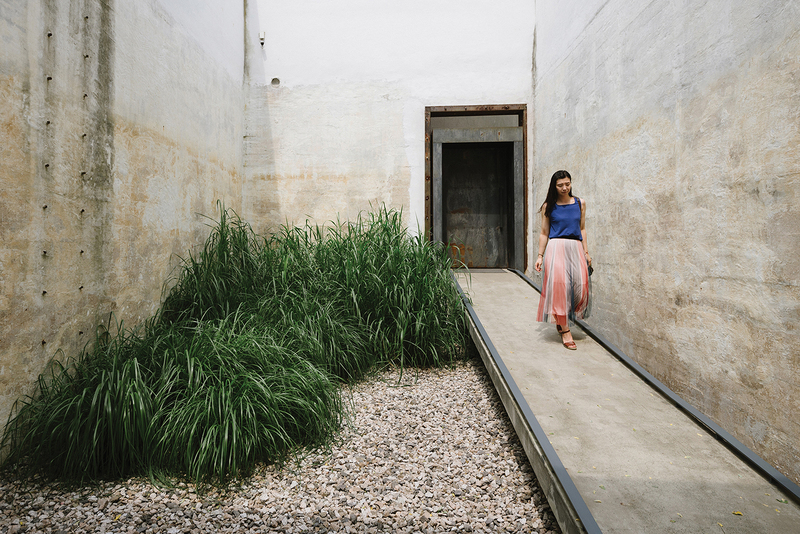 Huam-dong is one of many neighborhoods full of older buildings that offer sweeping views, which designers are eager to integrate into the renovation. Many of these buildings lack parking spaces and are difficult to reach by car, but, as elsewhere, many young people are giving up cars in favor of walking and public transportation. The British novelist L. P. Hartley famously wrote that “The past is a foreign country; they do things differently there.” The speed of change that resulted from years of rapid economic growth in Korea has turned even the near-past and the old things that it produced into a foreign country for the generation that has come of age in the 21st century. The varied buildings of the 20th century—Hanok, Japanese colonial-era houses, 1970s single-family houses, and aging apartments—appeal to young Koreans because they are exotic and “foreign.” The creative energy of this well-traveled, outward-looking generation is giving them new life as spaces that bring people to share a higher quality of life. Jacobs, no doubt, would have been very pleased.